One of the first pieces of equipment we fitted after installing the Solar Panels was the Sterling Battery Management Monitor and it has been a very worthwhile investment. 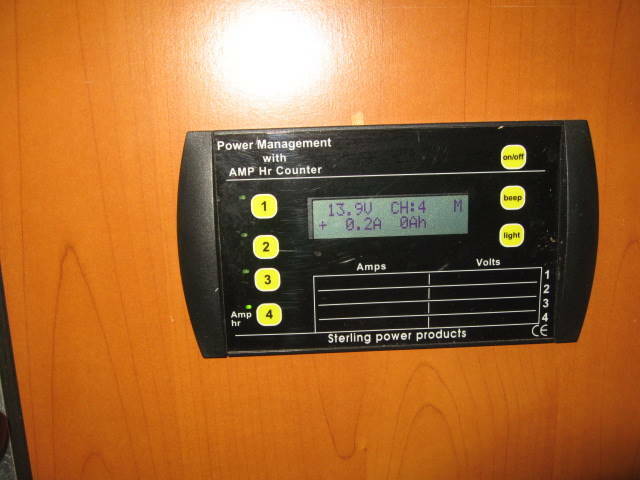 Most motorhome manufacturers usually fit a basic voltage and/or ammeter gauge so that owners have a rough idea of what state their battery(s) are in but they fall well short of giving you the full picture regarding power usage and recharging. True most of us at some time will have totted up the total wattage of our bulbs, fridge, water pump, tv etc. and guessed at the time each appliance is switched on. We then use a spreadsheet or back of a cigarette packet to try and work out how many amps we are using each day. Some are more accurate than others but I bet most of us err on the short side and scratch our heads when we run short of amps after a few days. Enter the Sterling monitor. When fitted this unit will tell you exactly where you stand. On the display screen it will give you the total net amps over the period, amps being received or drawn, battery voltage and if connected will give the engine battery state. It all works through a shunt and bus bar and is very accurate. The information will also include by deduction, solar panel output or alternator output and amps provided by the on-board charger, cutting out all the uncertainty of what is working and what is not. By switching on each appliance you can determine how much power it takes (or gives). It is very re-assuring to discover the true position when looking at the display and reading off the nett balance (0 = fully charged or a negative value say -50 indicates you have discharged more than you put in). By keeping an eye on the display, particularly in winter, you can see if the solar panels are replenishing your batteries or not. By knowing what your safe reserve is you can ensure you don’t damage your batteries or run the risk of flattening them completely. Installation is straight forward with a good instruction manual and depending on where you decide to fit the monitor head the job can be completed in half a day. The extent to which you go to to include the engine battery or not is up to you and the system can manage up to four separate battery banks. We had two separate leisure banks and an engine bank and it surprised me just how much we used per day and confirmed the viability of solar in winter. We have had our system fitted for over 5 years now and it has proved totally reliable and extremely useful, particularly in the early days when we were still learning the ropes so to speak. Appliances such as lighting or TV consumed much more power than I had thought and this quickly led to the replacement of all our halogen bulbs for LED’s, not to mention remembering to switch off all lighting not in use. We used to leave the inverter on standby, even the TV sometimes however once we could see how much power we were wasting we soon got into the right habits. Interesting how many amps our system uses when the main control panel is switched on but nothing else (to my knowledge that is) – over a 24 hr period, just using the central locking and system on standby consumed 8 amps.